When a friend of mine recently mentioned her idea to start a book club, I was super excited. I've been wanting to read more books outside of schoolwork and magazines, and a book club would provide the perfect opportunity. Besides, who doesn't love an excuse to get together with girlfriends and drink wine? 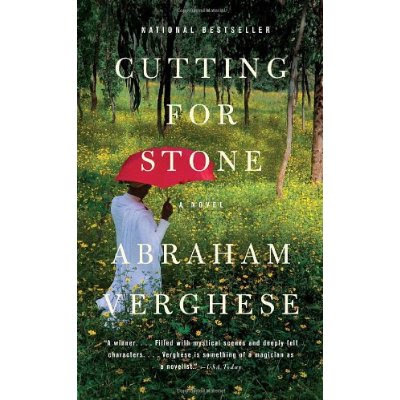 For any of you who want to follow along virtually, this month we are reading Cutting For Stone by Abraham Verghese. It's a long book (I better get reading as soon as it arrives, which hopefully is after I finish my final 20-page research paper... eek! ), but it has received some fabulous reviews and was personally recommended to me through work colleagues. Our book club plans to meet on April 3 to discuss, so check back here for updates on our discussion after that date. Happy reading! Lauded for his sensitive memoir (My Own Country) about his time as a doctor in eastern Tennessee at the onset of the AIDS epidemic in the 80s, Verghese turns his formidable talents to fiction, mining his own life and experiences in a magnificent, sweeping novel that moves from India to Ethiopia to an inner-city hospital in New York City over decades and generations. Sister Mary Joseph Praise, a devout young nun, leaves the south Indian state of Kerala in 1947 for a missionary post in Yemen. During the arduous sea voyage, she saves the life of an English doctor bound for Ethiopia, Thomas Stone, who becomes a key player in her destiny when they meet up again at Missing Hospital in Addis Ababa. Seven years later, Sister Praise dies birthing twin boys: Shiva and Marion, the latter narrating his own and his brothers long, dramatic, biblical story set against the backdrop of political turmoil in Ethiopia, the life of the hospital compound in which they grow up and the love story of their adopted parents, both doctors at Missing. The boys become doctors as well and Vergheses weaving of the practice of medicine into the narrative is fascinating even as the story bobs and weaves with the power and coincidences of the best 19th-century novel.